Original metal sign from 1960's. 69"L x 33"H. Brand new, never installed. Embossed raised lettering. Mounted on a wood frame. Crate from plywood for shipping - add $125, actual shipping costs will be added. Type set drawer. 16-1/2" x 32" x 1.5" high. Over 100 years old! Foot locker / chest. Arch top. All wood. End carry straps ok. Measures: 13" x 24" x 15" high. ADT fire alarm and sign. Hand crank. Antique sending unit. Sign dimensions: 9-3/4" x 5-3/4". Box dimensions: 5-1/4" x 8-1/2". 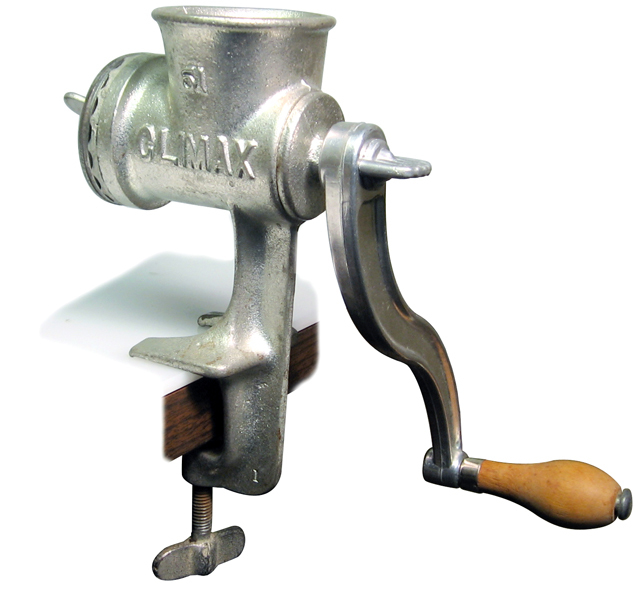 Climax food chopper. Includes instruction card. New, never used!! In the original box. Made in 1946. Removed from the Grand Island, Nebraska Music Conservatory shortly before it's demolition, this steel, wrought iron and brass elevator cage seems to be all there, but no promises. Floor is not included. Most panels have old masking tape labels describing how it might fit back together. I'm not sure of it's age but I would guess over 100 years old. A picture of the elevator top outlines the 54" x 57" perimeter. No lack of painted surfaces, oxidation and dirt. The wall height is about 7 feet. The left picture is a sliding door that had been restored and repainted by its former owner who intended to resurrect the cage. But now it sits in my warehouse taking up way to much room. Wouldn't it make a fine telephone booth or retro furniture for your home or business? Sold as-is. All sales final. • 3 - Door panels, 20-1/2” x 7’, solid bottom with taller wrought iron section than side panels.